The school promotes participation in after-school sports activities at all levels. High School sports are AIA Division V.
Athletic participation fees are collected to help with the cost of renting facilities and paying referees. These fees are considered Arizona Tax Credits. Athletic uniforms are not tax-credit deductible and charges may occur if the uniform is damaged or not returned. Contact Mark Swenson, Athletic Director, with any questions at (520) 749-1413. Most volleyball and basketball home games will be played at our opponents venue, please check the schedule closely. All soccer and softball home games will be played at Academy of Tucson Elementary School. 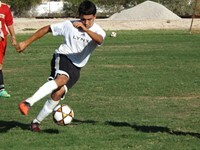 Academy of Tucson recently played against Desert Christian. 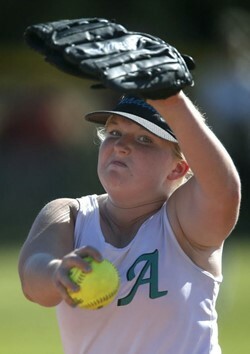 Junior pitcher Caitlin Doster (16-5) has been the ace for the Academy of Tucson, striking out 164 batters in 106 innings. 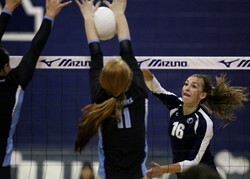 To no surprise, Ironwood Ridge’s girls volleyball team earned the No. 1 seed for the Division II state tournament. Prior to a student being permitted to participate in any sport, the sports participation forms must be filled out and turned in to the school. Both the participation forms as well as the athletic handbook are available to download below. All athletes must understand that grades are very important to playing: No Pass, No Play. The Academy of Tucson reserves the right to limit after school district sponsored activities for any student whose grades require attention. The student athlete is required to maintain a minimum 2.0 grade point average on a 4.0 scale and have no current F’s in any class. Student athletes who are academically ineligible may practice with the team but not participate in interscholastic contests or travel with the team. Academic eligibility will be determined on a weekly basis. Once an athlete is determined ineligible he/she will be ineligible for all contests that week. All student athletes are required to attend school the day following a game particularly after away games. (“Being tired” is never an excuse for missing school.) Failure to do so will result in a one game suspension. Medical/injury exemptions permitted. Student athletes must not engage in any behavior in violation of the student code of conduct or behavior which is disruptive of the athletic activity or event in which the student athlete is participating in or which constitutes a violation of any law or ordinance involving an act of violence, or dishonesty. The student athlete must comply with these standards of personal behavior through the entire twelve-month calendar year. Failure to do so will subject the student to disciplinary measures, which may include suspension and/or expulsion from participation in the student athletic program. The athletic director shall determine disciplinary measures, after consultation with the head coach.